Tribes have been protesting a new British Columbia pipeline for years. This article originally appeared at Crosscut.com. As the clash between police and protesters over the construction of a pipeline in North Dakota continues, tribal nations and environmentalists are gearing up to fight an even bigger pipeline in the Pacific Northwest. The battle to stop the pipeline in British Columbia and protect Salish Sea waters on both sides of the border could bring some of the largest environmental protests ever seen in Cascadia. On Thursday, a leader of the protests in Canada predicted that the pipeline will never be built, noting that the route of the pipeline will go right to Vancouver, the nation’s second largest city and a hotbed of environmental activism. It’s been a good week, though, for Kinder Morgan, a giant Texas-based multinational energy firm, and supporters of the company’s planned pipeline from the Alberta oil sands to British Columbia coast. On Tuesday, Canadian Prime Minister Justin Trudeau gave the green light to the construction of a new pipeline, dubbed the Trans Mountain Expansion Project. This one would triple the amount of oil going from Alberta to a shipping terminal in Burnaby, a suburb just east of Vancouver, increasing the capacity of the existing system from 300,000 barrels a day to 890,000. 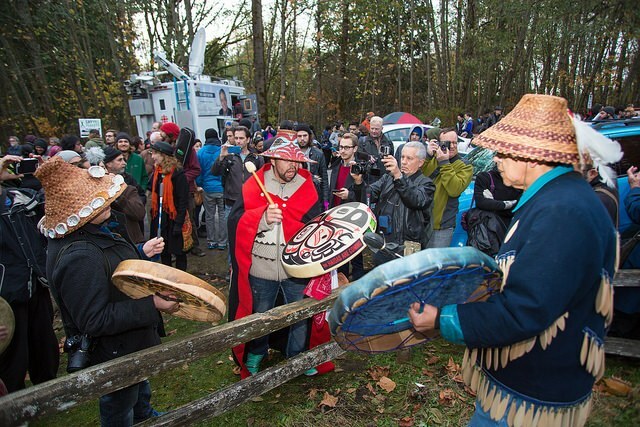 First Nations leaders have been protesting the Kinder Morgan plan since at least 2014. More importantly — to supporters and opponents — the plans will bring nearly a sevenfold increase in the number of oil tankers in the waters of the Salish Sea, from 120 per year to 816. The shipping would allow the energy industry and Canada to reap big returns from sales to refineries California and Asia. The $6.8 billion project is expected to make Canada the biggest oil producer in the Americas. Kinder Morgan proposed the expansion in December 2013, and Canada’s National Energy Board recommended approval in May. On Tuesday, Trudeau made the final decision to move forward with it, saying that he would impose strong environmental safeguards. And he said the project would provide many jobs as well as spurring larger-scale Canadian economic development. Four Washington tribes — the Swinomish, Tulalip, Suquamish and Lummi — fought the decision in Canadian hearings and immediately vowed to continue to work to overturn the decision. Jewell James, a Lummi Nation member and famed woodcarver, expressed disappointment, calling the proposal “a very big threat.” Tribal nations and environmentalists point to threats to fish, orcas and water quality. “We’re all very concerned about the quality of the Pacific Northwest for future generations,” James said. The Washington-based tribes will continue to work closely with the other Coastal Salish First Nations opponents of the pipeline, she said. The U.S. administration and Sens. Patty Murray and Maria Cantwell have done little or nothing to express concerns about tribal fishing rights and environmental protection, Boyles said, but noted that the Washington state Department of Ecology has expressed concerns about the effects of any tanker wreck. Immediately after Trudeau’s decision, an environmental group, Stand Up to Oil, called on the two Democratic senators, the rest of Washington’s congressional delegation and Gov. Jay Inslee to make their voices heard in opposition. Still, Boyle and others said it’s not immediately clear what U.S. opponents can do, other than to support the opposition in British Columbia while looking at possible legal strategies. A leading organizer there, Karen Mahon of Stand.earth, expressed optimism about stopping the project. “We do have a pathway to defeat this pipeline,” she said on a conference call with reporters Thursday morning. Mahon noted that two and a half years ago, the Canadian government gave similar, tentative approval to another West Coast pipeline, which would have been farther north in British Columbia. Legal action beat back that proposal, with a court ruling that the First Nations fishing and environmental concerns had not been adequately considered. In his Tuesday announcement supporting Kinder Morgan’s proposal, Trudeau said he wouldn’t appeal the ruling, effectively killing the northern route. Mahon said opponents would take a similar legal tack with Kinder Morgan’s Transmountain Project. She also pointed to political action, saying that more than 1,000 people had already trained in nonviolent civil disobedience tactics to prepare for protests in case Trudeau gave Kinder Morgan the go-ahead. A new round of training is coming up for protests that, she said, are likely to far exceed British Columbia’s epic battles that protected old-growth forests in the 1990s. She said some leading political figures have already promised to join the activists on the protest lines.